Stacy "Boston Shenanigans" started running in 2014 after 10 years of competitive soccer. She is a back of the pack distance runner and has completed over 107 marathons in all 50 states. She has also run multiple ultras, multi-day stage events, 5k's, 10k's, and half marathons. 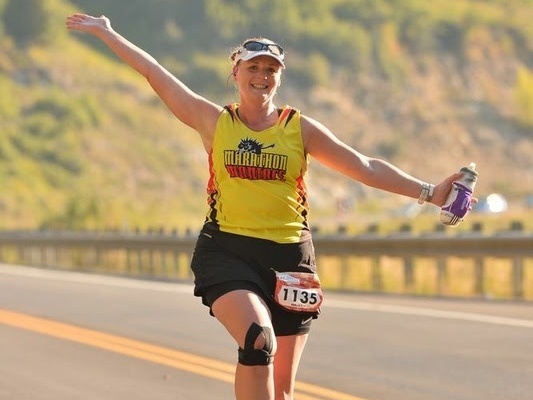 Her most 'epic run adventures' include running 6 marathons in 6 days in 6 states, running a 50k and 50m the same day, and running a marathon/50k/marathon triple in 32 hours. Her favorite races are the opportunities to support a runner to a goal. She's frequently at finish lines cheering in every runner. Stacy runs for the Achilles Freedom Team. She is a guide for athletes with mobility impairment and has guided athletes to a successful finish including New York City, Boston, and many other events. How else Stacy REVELs: She loves to travel, hike, volunteer, crew, and have fun. Her nick name was given to her when she showed up for a group swim with her Tucson Tri Girls Team, wearing her Boston Red Sox hat and flamingo arm floaties!